The films – chronicling a bloody tale of family, politics and power — tell the rise and fall of three Kings and how their destiny shaped English history. Richard II (Ben Whishaw) is a vain, self-indulgent man who rules with little regard for his people’s welfare. 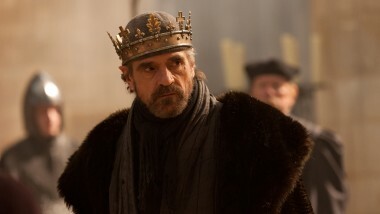 He is ultimately overthrown by his cousin Bolingbroke (Rory Kinnear), who ascends the throne as Henry IV (Jeremy Irons). 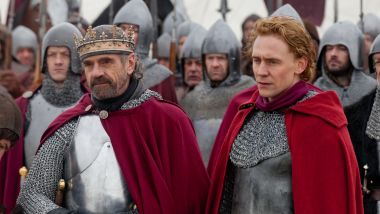 Henry IV’s reign is marred by his own guilt over Richard’s death, civil war, and the gnawing fear that his son Hal (Tom Hiddleston) is a total wastrel unworthy of the throne. When Hal comes to the throne as Henry V he is left to bury the ghosts of his father’s past while fighting both the French forces as well as his own inner demons. 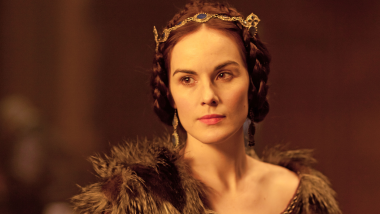 Neal Street Productions, NBCUniversal Internatinonal, and THIRTEEN have brought new life to William Shakespeare’s history plays in these epic adaptations. 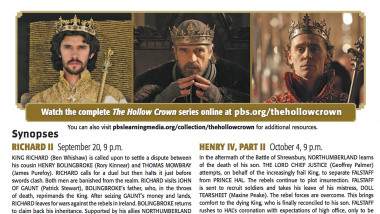 And this marks the first time these four plays have been seen on PBS since the epic BBC Shakespeare Plays series presented domestically by THIRTEEN in the early 1980s. 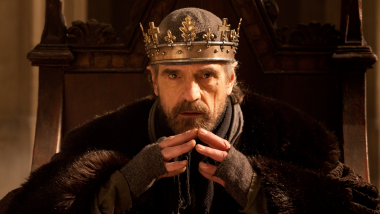 Directed by Rupert Goold (Richard II), Richard Eyre (Henry IV, Part 1 and Henry IV, Part 2) and Thea Sharrock (Henry V), The Hollow Crown features some of the most pre-eminent Shakespearean actors of our time. 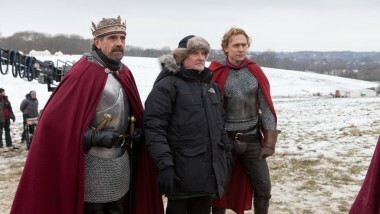 The Kings are played by Ben Whishaw, Jeremy Irons and Tom Hiddleston respectively, supported by a phenomenal cast including Rory Kinnear, Patrick Stewart, David Suchet, David Morrissey in Richard II, Simon Russell Beale, Michelle Dockery, Julie Walters and Maxine Peake in Henry IV and John Hurt, Anton Lesser and Paterson Joseph in Henry V. The plays were filmed on location in England between Summer 2011 and Spring 2012 and are all set in their authentic medieval period. The series premiered to rapturous reviews in the U.K., and was honored with BAFTA Television Awards for Whishaw (Leading Actor) and Simon Russell Beale (Supporting Actor), BAFTA Craft Awards for Original Television Music (Stephen Warbeck) and Sound (Fiction) (Richard II), and an RTS Programme Award for Single Drama (Richard II). KING RICHARD (Ben Whishaw) is called upon to settle a dispute between his cousin HENRY BOLINGBROKE (Rory Kinnear) and THOMAS MOWBRAY (James Purefoy). RICHARD calls for a duel but then halts it just before swords clash. Both men are banished from the realm. RICHARD visits JOHN OF GAUNT (Patrick Stewart), BOLINGBROKE’s Father, who, in the throes of death, reprimands the King. After seizing GAUNT’s money and lands, RICHARD leaves for wars against the rebels in Ireland. BOLINGBROKE returns to claim back his inheritance. Supported by his allies, NORTHUMBERLAND (David Morrissey) and the DUKE OF YORK (David Suchet), BOLINGBROKE takes RICHARD prisoner and lays claim to the throne. In the aftermath of the Battle of Shrewsbury, NORTHUMBERLAND learns of the death of his son. THE LORD CHIEF JUSTICE (Geoffrey Palmer) attempts, on behalf of the increasingly frail King, to separate FALSTAFF from PRINCE HAL. The rebels continue to plot insurrection. FALSTAFF is sent to recruit soldiers and takes his leave of his mistress, DOLL TEARSHEET (Maxine Peake). The rebel forces are overcome. This brings comfort to the dying King, who is finally reconciled to his son. FALSTAFF rushes to HAL’s coronation with expectations of high office, only to be rebuffed by the former prince who has now become King HENRY V.
HENRY V has settled onto the throne and has the makings of a fine King. The French AMBASSADOR (Jérémie Covillault) brings a challenge from the FRENCH DAUPHIN. Inspired by his courtiers, including EXETER (Anton Lesser) and YORK (Paterson Joseph), HENRY swears that he will, with all force, answer this challenge. The CHORUS (John Hurt) tells of England’s preparations for war and HENRY’s army sails for France. After EXETER’s diplomacy is rebuffed by the FRENCH KING (Lambert Wilson), HENRY lays a heavy siege and captures Harfleur. The French now take HENRY’s claims seriously and challenge the English army to battle at Agincourt. HENRY and his meager forces prove victorious against all odds. GREAT PERFORMANCES is a production of THIRTEEN for WNET, one of America’s most prolific and respected public media providers. Throughout its 40 year history on public television, GREAT PERFORMANCES has provided viewers across the country with an unparalleled showcase of the best in all genres of the performing arts, serving as America’s most prestigious and enduring broadcaster of cultural programming. Over the course of its four decades, the series has been the home to the greatest artists in the areas of drama, dance, musical theater, classical and popular music, providing many with their very first television exposure. The Executive Producers are Pippa Harris and Sam Mendes for Neal Street Productions and Gareth Neame for NBCUniversal International and David Horn for Thirteen/WNET. 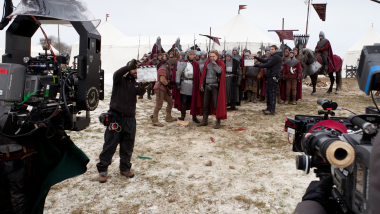 The Hollow Crown was commissioned by Ben Stephenson and Janice Hadlow for BBC Two and was produced by Rupert Ryle-Hodges. Richard II was adapted for the screen by Rupert Goold and Ben Power; Henry IV, Parts 1 and 2 by Richard Eyre; and Henry V by Ben Power. Major funding for GREAT PERFORMANCES is provided by the Irene Diamond Fund, The Starr Foundation, Vivian Milstein, Rosalind P. Walter, the LuEsther T. Mertz Charitable Trust, The Philip and Janice Levin Foundation, Joseph A. Wilson, Jody and John Arnhold, The Agnes Varis Trust, and PBS.